A few years back, HP issued a recall for laptop power cords. They sent the replacement cord along with these detailed instructions for the disposal of the potentially defective cord. Now, if a user was clever enough to plug in their laptop, take note of the recall notice, and follow the steps to order the replacement cord, one might have inferred that the user would not need these “instructions” to ensure the safe disposal of the defective cord. However, HP obviously felt it was better to be safe than sorry. At the risk of repeating a message you have heard from us before, and that might seem blatantly obvious to many, DOCUMENT YOUR FILE! You might have a perfect recollection of your discussions with, advice to, and instructions from your client. However, if things do not turn out in your client’s favour, their recollection of how events transpired might come to differ greatly from yours. Your file is your best tool to protect yourself from an unwarranted claim to LIANS or complaint to the Nova Scotia Barristers’ Society. Create a record that will refresh your recollection and corroborate your advice and instructions on important points through the progress of a file. Jot down a note of your telephone conversation, with the date and time. Send your client a short letter confirming that you discussed a settlement offer and, notwithstanding your recommendation that they accept it, they instructed you to reject it. Send your client a letter that confirms you discussed the risks of an adverse cost award if they proceed to trial and lose, but that they wish to proceed to trial. Take detailed notes of your client’s will instructions. Dictate a memo to file, summarizing the meeting you just had. Provide your client with a detailed statement of account, itemizing the work that you’ve done for them to the billing date. DOCUMENT YOUR FILE. For the client who has genuinely forgotten the specific advice, you will be able to objectively remind them of the advice given at the time, thereby heading off a claim or complaint before it is ever made. If a claim or complaint is made, you will be armed to defend yourself. 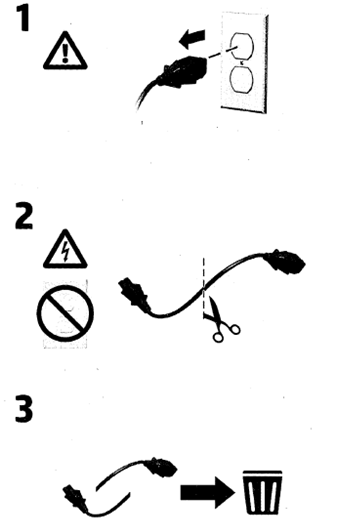 To dispose of a defective cord: 1) unplug it; 2) cut it in half; 3) throw it in the trash bin. To avoid a potential claim or complaint: 1) give appropriate advice; 2) make a note of it; 3) save it in your file. LIANS offers the following sample forms on our site (all can be highlighted, copied, pasted and edited). There is no one way to document your file, so feel free to use one of these forms or modify to create your own - just be sure to document your dates!